Mods, patches and new content aren't the only reason not to buy PC games on release day. Hardware costs also come into play. You know that high-end video card you bought last summer in anticipation of Crysis' release? The new version is out, and it's cheaper. Owing to the ongoing availability of faster, cooler, and more efficient components, it's already significantly less expensive to explore Crysis'beautifully rendered frozen jungle environments than it was last November. Consoles aren't far behind, of course, in this era of add-on content and successive releases. 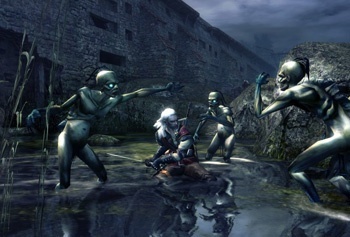 Enhanced or Director's Cut versions of games like Fatal Frame II: Crimson Butterfly and Metal Gear Solid 3: Subsistence were the last-gen console equivalents of what we're currently seeing with The Witcher. One need look no further than Warhawk's expansion packs, Mass Effect's downloadable story content, or GTA IV's anticipated updates for evidence that current console games are headed in a similar direction. Still, for the moment, most console game experiences begin and end with the initial retail product. There's a plus side to PC games' tendencies to improve with age: community longevity. Console gamers seem more inclined to rush from one title to the next than PC gamers, who often stick to their shooting, questing and strategizing selections for months and even years. Even decades-old games like Ultima Online still have small but vibrant player communities. So should PC gamers get used to waiting it out? Is delayed gratification the answer to our gaming woes? I'm not so sure. Ironically, it's the PC games that are successful immediately upon release that provide developers with the justification (and capital) to make major improvements down the road. I doubt CD Projekt would have announced a new version of The Witcher if it hadn't sold 600,000 copies in the months following its release. I don't think Age of Conan would be the current recipient of extensive twice-weekly patches if it hadn't shipped approximately one million copies in its first few weeks. It might be a good thing, then, that so many PC gamers, like their console-loving counterparts, are reluctant to delay their gratification. If CD Projekt remains true to its word, this fall I'll be able to play a superior version of The Witcher in large part because a few hundred thousand of my fellow gamers couldn't wait to buy the original version of the game last year. I suppose it's best to look at PC game purchases as long-term investments, then. When I buy a PC title, I know I'm not going to be able to trade it in a few weeks later for cash toward my next game, as I often do with console releases. But I do know that weeks and months down the road I just might have a much better game installed on my hard drive, one worth returning to long after its release. And there's certainly nothing wrong with that.